Harvard affiliates gathered to protest Chicago mayor Rahm Emanuel's visit to the GSD. 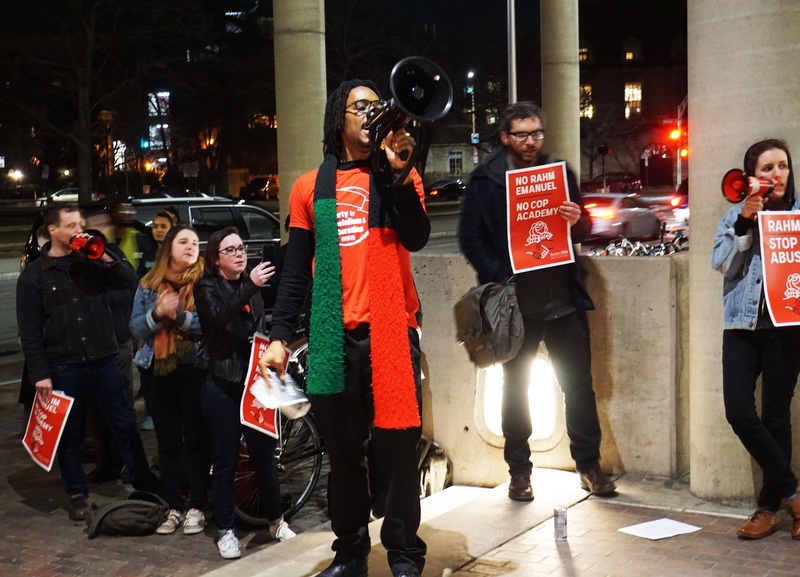 Hosted by the Answer Coalition Boston and the Party for Socialism and Liberation Boston, the protest was organized to publicly criticize the Chicago mayor’s policies. “We seek to gather to denounce the crimes of the Rahm Emanuel administration against poor and working families, especially Black and Brown communities of Chicago,” read a Facebook event page created to organize the protest. For two hours Tuesday night, protesters chanted slogans including “Rahm Emanuel you’re a tool, hands off Chicago’s public schools!” and “From Palestine to Chicago, Emanuel has got to go!” They also held signs reading “#ResignRahm” and “No closed schools, no cop academy,” in reference to a planned $95 million police academy announced by the Emanuel administration. The protest did not interfere with the event itself, where Emanuel discussed his tenure as Chicago mayor with GSD Dean Mohsen Mostafavi. The conversation was co-sponsored by the Harvard Joint Center for Housing Studies and the Design School’s Office of Communications. Emanuel has been met with protests at his recent visits to other college campuses as well, including at UCLA and the University of Michigan. 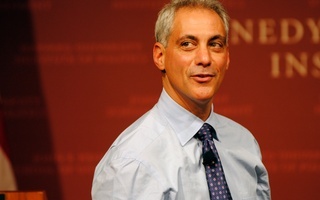 After previous protests, Emanuel’s spokesperson Adam Collins told the Chicago Tribune that the dissent was "no surprise." “Anyone who has spent any amount of time on any college campus has probably protested something at some point. There’s really no surprise here,” Collins said. The Facebook event page for Tuesday’s protest accused Emanuel of responsibility for and complicity in gentrification, police brutality, and austerity across Chicago. “Rahm Emanuel, and the Democratic Party machine of which he is part and parcel of are no friend to poor, working people, people of color, or any progressive minded person,” read the protest event’s description. Last week, students at the GSD penned an open letter to Emanuel signed by nearly 70 Design School students and community members, and sponsored by the GSD African American Students Union and the Harvard Urban Planning Organization. 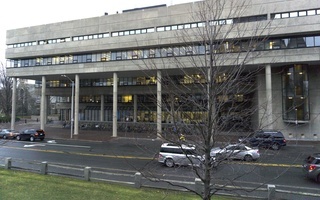 Jaydee Davis, a member of the Answer Coalition Boston, said the goal of the protest was to disrupt Emanuel’s arrival at Harvard by demonstrating against his controversial policing and schooling policies. A University spokesperson could not be reached for comment Tuesday night. —Staff writer Archie J. W. Hall can be reached at archie.hall@thecrimson.com. 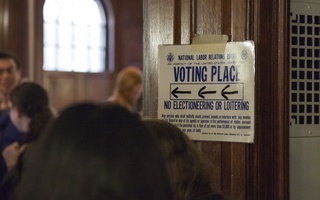 Student voices and grievances are valuable contributions to open dialogue and a comprehensive Harvard education.